The Text of the Gospels: eZooMS: Making Paleography Obsolete? and so has The Hornby Bible. PROBLEM: One of the most frustrating aspects of manuscript-studies involves estimates. Very often, unless a copyist has left a colophon that mentions the date when the manuscript was produced, the production-date of the manuscript can only be estimated via analysis of the handwriting-style. Paleographers – analysts of ancient handwriting – may not always agree, however, and occasionally their estimates vary widely, not just by decades but by centuries. Even worse is the variation in theories about the location where manuscripts were made. Scholars have proposed that Codex Vaticanus, for instance, was made in Alexandria – or in Caesarea – or in Rome. Codex Bezae has been thought to have been made in Italy in the 600’s – or in Beirut around 400. Sometimes colophons mention the place where a manuscript was made, and sometimes illustrations, decorations, and other meta-textual features in the manuscripts provide clues – but all too often, determining the location where a manuscript was made is a matter of calculated guesswork. SOLUTION: Timothy Stinson, Associate Professor of English at North Carolina State University, realized in 2009 that with developing technology, scientists could analyze the DNA in the processed animal skins – that is, parchment – out of which most ancient manuscripts are made. By 2015, a non-destructive method was developed to obtain genetic samples of parchment – enough to allow genetic analysis so detailed that it identifies the species of animal whose skin was used, and whether it was a male or a female. Parchment is sometimes not the only DNA-source in a manuscript. Beetles and other destructive pests sometimes left their DNA behind. When venerated manuscripts were kissed, a DNA-sample left by the the kisser may survived to the present day. 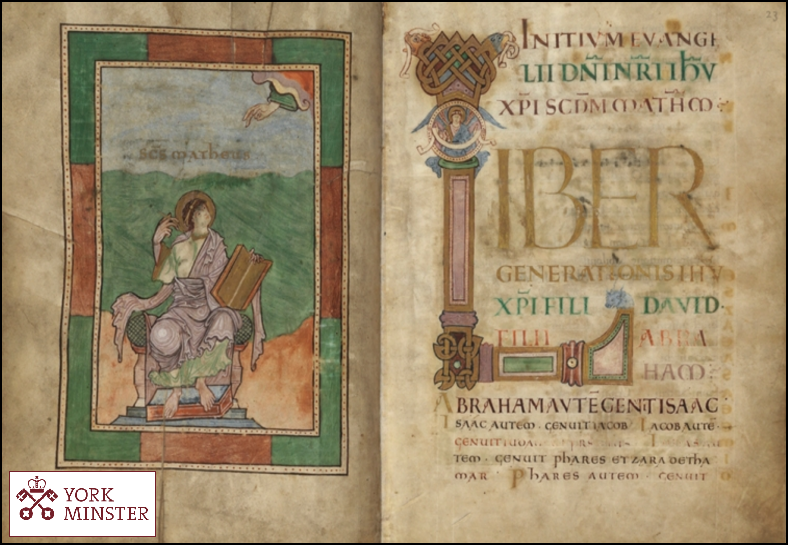 The team applied this analysis-technique to a historically significant Latin Gospels manuscript, the York Gospels, which is kept at York Minster, in the city of York (the same place that was captured in 866 by Ivar the Boneless, the famous Viking). Nowadays, New Testament textual critics group manuscripts according to their readings. Theoretically, in the future it may be possible to group manuscripts according to parchment-sources distinct to specific areas. It may be possible to identify locales of New Testament manuscripts, not just in theory by showing that the textual variants in a manuscript are shared with a patristic writer whose locale is known, but by isolating organic abnormalities (from pollen, beetles, wax, etc.) of each manuscript and determining what other manuscripts, if any, share the same or similar abnormalities. For example, suppose that eZooMS shows that a particular group of manuscripts shares a special kind of parchment (parchment made from aurochs-skin, for example). This could point researchers toward the next logical step: studying those manuscripts’ texts to look for relationships among them. Or, suppose that different groups of Gospels-manuscripts, or different groups of lectionaries, are someday shown to be made of parchment from the skins of animals that lived only in particular places, or that a particular group of manuscripts consists of parchment which was prepared in a unique way, and which was as result either particularly resistant to, or vulnerable to, beetles. Having that sort of data could help define the parameters for particular manuscript-groupings, along with data such as manuscripts’ page-size and rulings. In addition, although I did not notice anything in the descriptions of eZooMS that would suggest that it can reveal the age of parchment, it seems to have the potential to reveal details about where a manuscript was made and what happened to it afterwards, and it does not seem unlikely that thoughtful analysis of that data (combined, perhaps, with ink-analysis) may be able to narrow down a manuscript’s provenance and production-date more precisely that what is possible via paleography. The Ethiopic Garima Gospels, when subjected to radiocarbon tests of its parchment, was found to be about 500 years earlier than paleographers had thought. Perhaps future applications of sampling-techniques such as eZooMS will yield many more such surprises in the future.